Box of Pasta of choice. Place chicken in large Ziploc bag and cover with sauces. Place bag of chicken with sauces in the bottom of the slow cooker. Sprinkle with salt and pepper. Cook high for 4-6 hours or low for 6-8 hours. Meanwhile cook pasta as directed on package. Serve chicken over hot pasta with sauce. In a gallon size freezer bag pour chicken pieces, onions, garlic, chili powder, cumin, boullion cubes and green chilies. In a snack size bag place snipped cilantro. In a sandwhich bag pour 1 cup of cheddar cheese. Pack all of the bags into another gallon size bag. Pour chicken mixture into an 8 qt. pan. Add 6 cups water. Heat on medium high until boiling. Reduce heat and simmer 10 minutes. This may also be cooked from frozen and/or in a crockpot. Serve by placing tortilla chips in the bottom of your bowl. Ladel soup over the top. Place cheese on the top and sprinkle with cilantro if desired. You may also add sour cream if you like, we didn't think it needed it. Assembly:Add taco seasoning to browned meat. Pour all ingredients in gallon size Ziploc bag. Lay flat to freeze. Serving Day:Thaw. Place in large pot. Simmer until warm. Top with shredded cheddar cheese and crushed tortilla chips. This recipe is from Taste of Home - Busy family Favorites Cookbook, by Vikki Rebholz of West Chester, Ohio. Measure macaroni and place in sandwhich size ziplock bag. In a pan on medium heat, cook beef and onion until meat is no loger pink; drain. 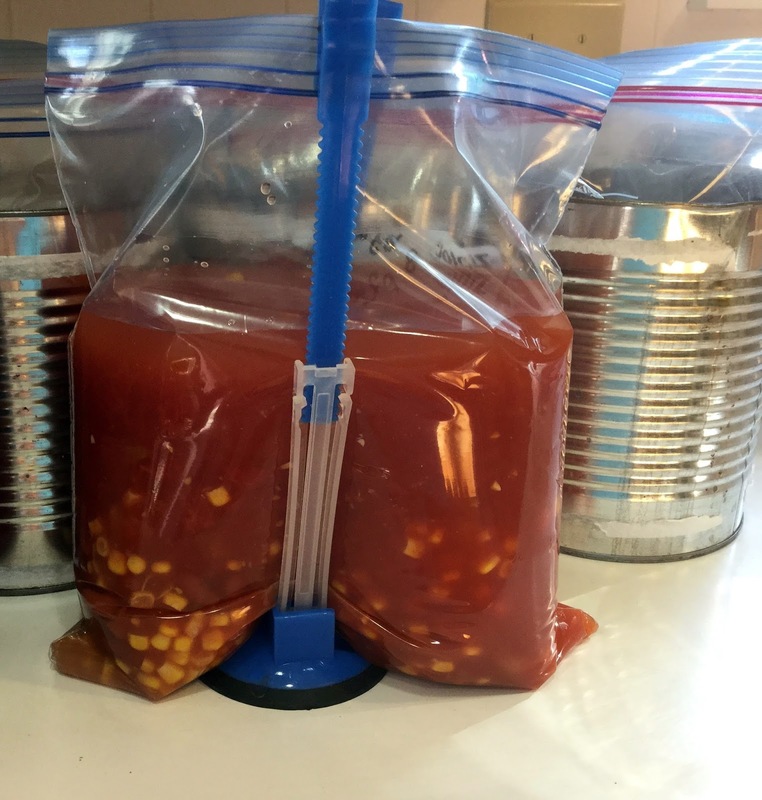 In a gallon size ziplock bag, place tomatoes, corn, tomato sauce, chillies, cumin, pepper, salt and cooled meat. Mince fresh cilantro and place in snack size ziplock bag. Place all bags in another ziplock bag together and place in freezer. Thaw. Cook macaroni. Meanwhile, heat meat mixture bag, bring to a boil and simmer uncovered until heated through. Drain macaroni, add to meat mixture. Stir in cilantro and heat through. Serve. Place chopped onion on the bottom of the slow cooker bag. Remove giblets from chicken and towel dry it very well, both inside and out. Using your fingers, gently pry the skin away from the chicken all around so you'll be able to season chicken underneath skin. I made slits in 6 different slots, 2 on top and 1 on the bottom to do this. In a small bowl, combine all the spices, from salt to pepper. Mix well. Use your hands to evenly spread two thirds of the spice mixture onto chicken, underneath the skin. Be sure to include all areas of chicken (legs, back, thighs, etc). Use remaining spice mixture to spread on top of the skin. Place seasoned chicken on top of the chopped onion in the cooking bag. Close and keep chilled overnight if serving the next day. I froze mine by putting the cooking bag inside of a Ziploc bag. Thaw in your fridge for 2 days. Place bag with chicken in slow cooker. Cook on Low 5-6 hours. Keep on warm until ready to serve. I wanted to try to cook this from frozen on High for 5-6 hours. Let me know how it was. This dish is delicious over fluffy rice or potatoes. Mix ingredients (only mix 1/2 can of soup) together and shape firmly into loaf. Place into foil loaf pan. Cover with foil and freeze. Place remaining 1/2 can soup in small plastic bag and freeze. Thaw completely in fridge. Remove foil, pour 1/4 c. water around the edges of the loaf. Bake at 350, uncovered, for 1 hr and 15 min. Blend tomato soup in bag with 1/4 c. water and 2-3 Tbsp of drippings from meatloaf. Heat in small saucepan and pour over meatloaf.